BGKLLEN and Victoria University have both commissioned major research into the flexible learning programs. Read the research here. In 2013 and 2014 two research reports were published by the BGKLLEN based on data from the flexible learning providers in the southern metropolitan Melbourne region – A Different Journey (Ellum & Longmuir, 2013) and The Next Journey (Waugh, 2014). Both reports identified the need to establish networks or communities of practice that would link providers more effectively. As a result, four organisations (SkillsPlus, Melbourne City Mission, Brotherhood of St Laurence and Narre Community Learning Centre) applied for ACFE funding in 2015 to start a project that lead to the development of Flexible Learning Victoria (FLV) under BGKLLEN project management. 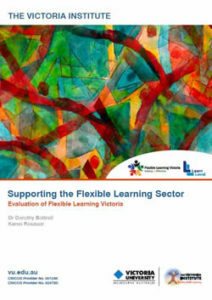 FLV is a professional body established to support the work of flexible learning program providers in Victoria. Flexible Learning Programs (FLPs) provide educational pathways and support to young people who have experienced barriers to completing secondary education in mainstream contexts, mainly due to social marginalisation or socioeconomic disadvantage. FLV has focused on facilitating formation of new, and strengthening existing, regional Flexible Learning Networks. Victoria University carried out an evaluation of the project that found key achievements of FLV in its first year included establishing an overarching body, with the diverse FLV stakeholders now referring to “the sector” and identifying FLV as a “peak body”; supporting over 13 professional learning events across Victoria; facilitating connections with over 25 new partnerships identified by stakeholders and enabling advocacy as a credible umbrella organisation, speaking on behalf of the sector in consultative conversations with the Department of Education and Training. In addition, a major piece of research has been completed titled ‘A Successful Journey – Defining the measures of success for young people in flexible learning programs’. Using qualitative and quantitative data captured from over 80 participants, it tells the story of how broadening measures of success enables young people in FLPs to succeed, overcoming adversity along the way. The program’s funding ended term 2 2017 but the consortium partners and BGKLLEN welcome any enquiries.